There's a new company under the Royal Caribbean umbrella, but this isn't another cruise line. It's GoBe, a tour booking website. MSC passengers will finally be able to choose their dining times - to an extent. Beginning with MSC Meraviglia and MSC Seaside, the line will begin offering customers a choice of Classic dining (so they can have their same table and companions and waiters each evening at either early or late seating) or Flexi Dining. The US Coast Guard said they suspended their search tonight at 7:31pm for the 23-year-old man who went overboard from Carnival Victory in the early morning hours Wednesday. The US and Cuban Coast Guards are tonight searching for a 23-year-old Florida man who fell overboard from Carnival Victory about 3am Wednesday morning when it was off the northern Coast of Cuba. 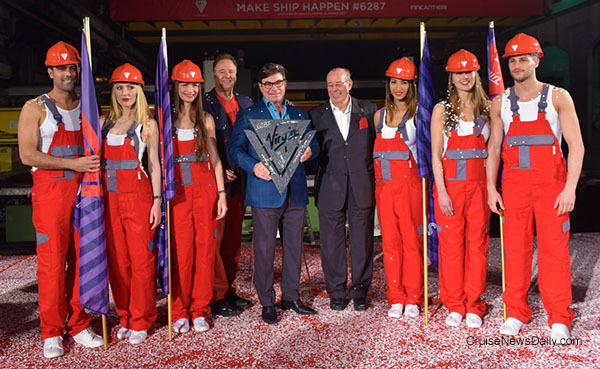 Fincantieri cut the first steel this evening for the first of Virgin Voyage's three 110,000-ton ships on order. The ceremony was held at the company's Sestri Ponente yard near Genoa. 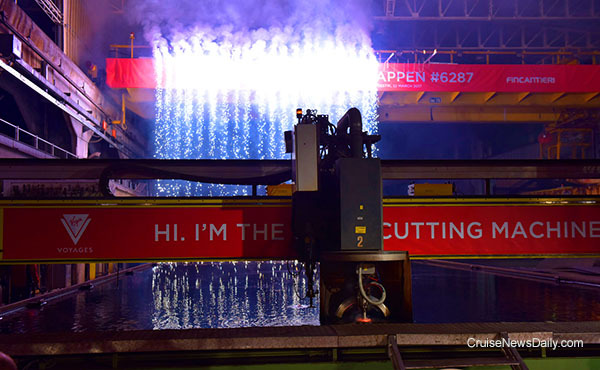 The first steel is cut for the first of three 110,000-ton vessels odered by Virgin. This is not your typical corporate event. Virgin president and CEO Tom McAlpin (center) holds the ceremonial first cut. 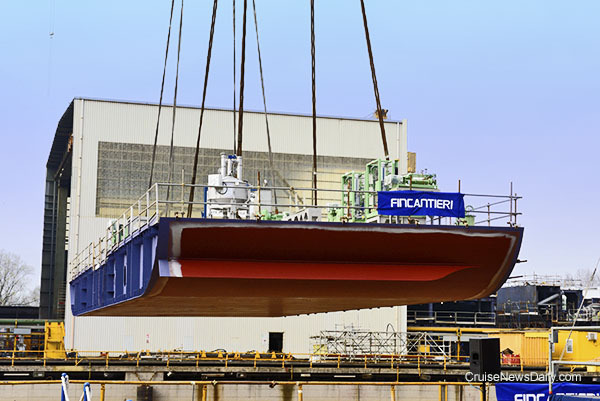 Photos courtesy of Fincantieri. All rights reserved. May not be copied o used without express permission. For a time it seemed that cruise lines had all but abandoned the once busy port of Acapulco. At one time Acapulco was popular both as a port of call and also a turnaround port, but cruise lines left as drug gang violence controlled the city. As authorities have begun to again control the city, cruise lines have begun to return. But a growing lack of security has caused Holland America to cancel all their calls in the 2017/2018 schedule. Carnival is expanding, but not in a way the average customer would notice. You have to go behind the scenes - way behind - to see it - in Seattle. Last week's expansion is actually the middle of the process, having started a couple of years ago when Carnival opened their first Fleet Operation Center in Hamburg to service the AIDA, Costa and Costa Asia fleets. Later this year the third one will open in Miami and the entire 102-ship fleet will be covered by the three centers. Dry dock work began today for the sister to Koningsdam, Nieuw Amsterdam, at Fincantieri's Marghera yard today, when the keel was laid. Details appeared in the March 20 edition of Cruise News Daily. 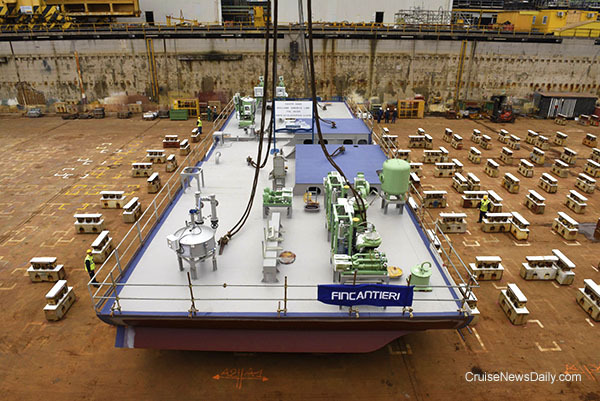 Photos courtesy of Fincantieri. All rights reserved. May not be copied or used without permission. 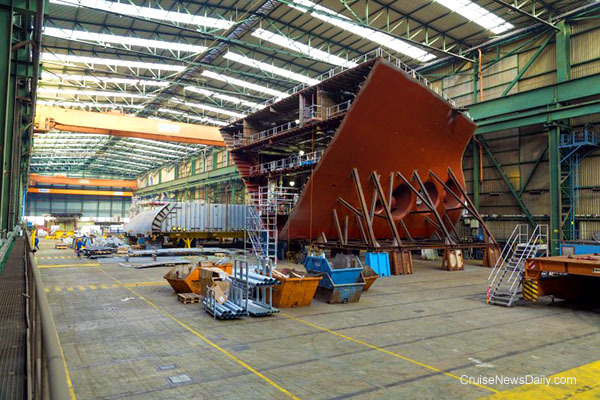 Building Hall IV at Meyer Werft in Papenburg (Germany) is being lengthened by about 100 meters to accommodate a new production method that will have the yard turning out cruise ships faster than ever. The complete story appeared in the March 20 edition of Cruise News Daily. Have you ever wondered where they get those families they show in cruise line commercials? In Disney's case, they had a general casting call last weekend, and any family could have come to Orlando and auditioned. Well, almost. Disney was rather specific about what they were looking for.